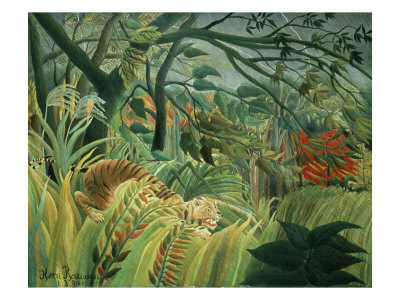 Rousseau is best known for his jungle and animal scenes which have drawn huge interest from the international art mainstream who found a great charm within his work. His work is sometimes classified as Primitivism though in truth his style is very much his own, and the subjects which he chose to depict are similarly imaginative. Paintings such as Snake Chamer and Dream placed Henri Rousseau as an important and highly memorable painter which this website is devoted to. French art has long since dominated within Europe since around the middle of the 19th century when it came upon a long spate of imaginative artists who helped push on ideas from previously traditional styles that were starting to appear stale to those who were more contemporary-minded. The Renaissance had been heavily led by artists from Italy and then France took the lead in a similar way around the 19th century thanks to painters like Henri Rousseau plus the impressionists. 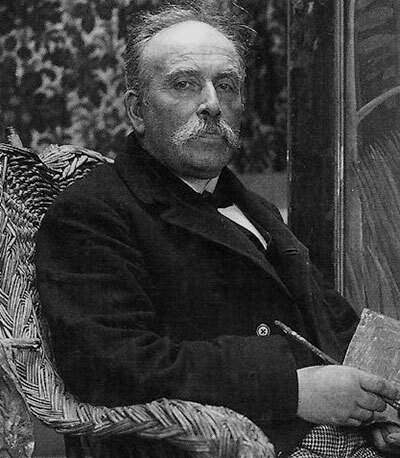 Henri Rousseau was not taken seriously by academics during his own life and it is only the popularity of his work within the public that has ensured his reputation remains strong in the modern day. Rousseau was sadly derided as an artist perhaps due to his highly contemporary approach as well as the fact that he hadn't had any traditional training, as such, though this is probably now seen as an advantage towards him being so innovative and unique. As you will see from the Henri Rousseau gallery included throughout this website, his style remained consistent throughout all of his most notable paintings. Famous paintings from Henri Rousseau included the likes of The Sleeping Gypsy, The Merry Jesters, The Snake Charmer and The Dream although there are many more than this which are worth checking out and they are all included throughout this website. Fernand Leger, Max Beckmann and Jean Hugo are all known to have been influenced by Rousseau and are likely to have picked up on his charming choice of subject as well as a contemporary use of colour and detail. Henri Rousseau was an imaginative and highly original French artist who created a reputation which remains very strong even today. His life was spent predominantly with in the 19th century and his best work came towards the end of that period, which also included several other crucial painters who are still internationally acclaimed today. 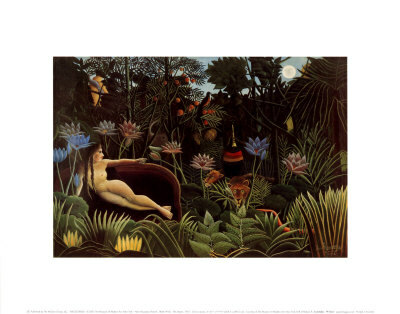 This website covers the full life and career of Henri Rousseau and lists all of his most famous paintings. You can also find Rousseau paintings here. Henri Rousseau's paintings featured a very characteristic style that has been loosely classified with in the art movements of Post-Impressionism, Naive art and Primitivism. Academically, his approach was treated with distain by many at the time of his career, but fans with in the mainstream art world have found great charm with in his paintings that has helped him to become a highly appreciated painter. The best known works by Henri Rousseau included titles such as The Sleeping Gypsy, The Merry Jesters, The Snake Charmer and The Dream although the fuller list from his career is far longer and included further down the page. A selection of his best paintings such as those mentioned here are included as images throughout this website, and accompanied by links from which you can buy your own Rousseau reproductions as framed or unframed giclee art prints, posters or stretched canvases. Henri Rousseau featured a style within his work that whilst very original, and almost cartoon-like, bears some resemblance to certain artists who are known to have inspired him and served as study topics for a young Henri as he saught new influences at the start of his career. 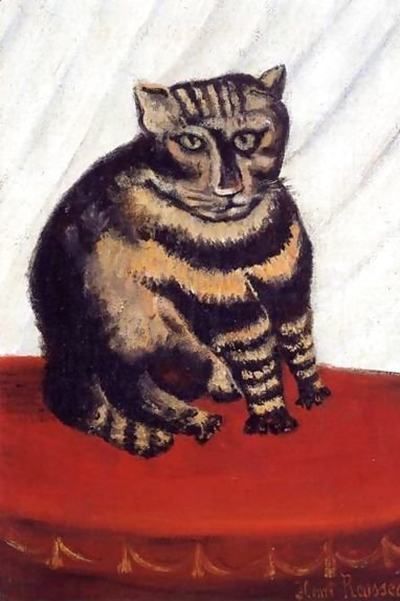 Amongst the artists believed to have been of interest to Rousseau were Fernand Léger, Max Beckmann and Jean Hugo who were also based in contemporary periods. 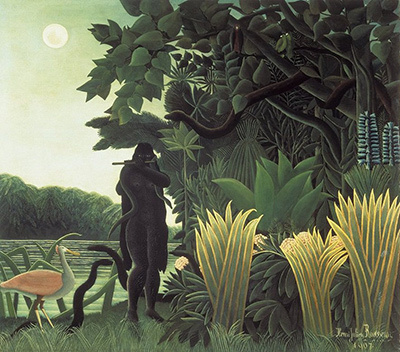 Rousseau was determined to not let his art become too reliant on what had gone before and his individualistic approach was very important to him. He remained relatively untrained and that helped to preserve his methods. Despite his clear dis-connection for academics there were two who are believed to have given him at least some guidance in his early days, namely Félix Auguste-Clément and Jean-Léon Gérôme. They were two that he respected for their own impressive careers. The artist consistently tried to get acceptance for his paintings and was constantly frustrated at his failure to do so, but it is only now that he has managed to get a broad level of approval, with Rousseau paintings becoming exceptionally popular as art reproductions, normally in the forms of framed giclee art prints, posters, stretched canvases and in some cases, handmade oil reproduction paintings. Henri Rousseau jungle paintings are what the artist is best remembered for and he produced many charming works along the jungle theme, varying his choices of human characters and animals, as well as the surrounding foliage. 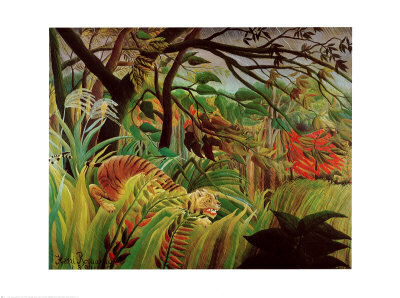 Examples of his jungle paintings included Exotic Landscape, Fight Between a Tiger and a Buffalo, In a Tropical Forest Combat of a Tiger and a Buffalo, The Equatorial Jungle, The Sleeping Gypsy, The Dream, The Hungry Lion Throws Itself on the Antelope and Tiger in a Tropical Storm (Surprised!). Henri Rousseau is just one of many impressive artists to have come from France during the 19th century, with most others linked to the supremely impressive and influential impressionist art movement which was spearheaded by the likes of Claude Monet. Rousseau's own career was particularly separated by this as he struggled to gain academic acclaim for his own style which many considered to be childish and too simple. Sleeping Gypsy. Rousseau was a great example of yet another painter who brought contemporary ideas and unusual techniques to the art world that was to struggle during the life of the painter for acceptance, and only truly be appreciated and understood several generations after his life has passed by. Contemporary styles often simplify objects and that is now an accepted form of art, and led to more extreme ideas such as abstraction. In today's art world Henri Rousseau paintings can be found in many major art galleries and museums right across the world and his legacy can also be shown by the other artists who followed after him whose styles beared cleared similarities to the cartoon-like methods of Rousseau. His use of charming animals within jungle scenes will proabably always remain what he is best known for. Henri Rousseau had a colourful style which was termed Primitivism because of it's similarity to cartoon, with a technique of depicting animals and people which some academics labelled as naive and childlike. Fortunately there have been enough who enjoyed his work that his name and reputation has grown steadily in recent years to a point where his original paintings are highly sought after, with many taking prominent positions within significant national galleries and museums across Europe and North America. The popularity within the art public of Henri Rousseau has ensured that his original paintings are frequently bought as fine art print reproductions right across the world, with posters and stretched canvas copies also being purchased. The style of his work and the clear lines of his portraits, as well as the colourful makeup of his scenes, ensures that they are ideal for printed reproductions with framed giclees typically offering the most accurate form of reproductions of all. With so many people looking to buy Henri Rousseau reproductions online we decided it would make sense to include links within this website to where you can do exactly that, and we have carefully chosen the Art.com Rousseau prints gallery as our recommended resource as we have regularly used them ourlselves so are very confident in suggesting them as the best place to start. We have a framed reproductions of Dream on our wall, and expect to purchase more from them in the future. Throughout his career Henri Rousseau features heavy use of his favoured animals which take up the jungle scenes in which he would only occasionally add people in as well. Where models are used, they would inevitably be the focal point of that particular painting where as when a mixture of animals were combined the key focal point was often less obvious. Monkeys were amongst the most common animal used and colour would always be a major factor when the artists was deciding who to include. Brightness was essential when adding subjects on top of his normally dark green jungle backgrounds. Post-impressionism is a large umbrella of contemporary ideas which Henri Rousseau broadly fits into and Primitivism came a long as just a more specific label with which to classify his work. Many post-impressionists struggled within their lifetime to attract academic acceptance and so Henri Rousseau was not unusual in this regard. It is always pleasing to see any painter finally recognised once their contemporary and original approaches are finally understood. Those who enjoy the style used by Henri Rousseau should also check out the breadth of contemporary art movements which may also be of interest, such as Pop artists whose approach also gives a relatively cartoon-like finish. Within this are the likes of Andy Warhol, Roy Lichtenstein and David Hockney who all have impressive careers which are worth checking out. Post-impressionism also contained vincent van Gogh who needs no introduction and certainly brought about his own impressive legacy. Whilst Henri Rousseau is best known for his jungle paintings, there are also significant amounts of other subjects, such as his own depiction of the Eiffel Tower and some beautiful flamingos. All artists become labelled for a certain style which is normally just a small selection of their overall career output and Henri Rousseau was no different to this. Despite his change in subject, though, his overall style was always consistent with a cartoon-like approach and use of bold colours that attracted so many fans within the 20th century and continues to do so today. Please see below for a summarised list of the best Rousseau paintings that are featured throughout this website. Disclaimer: HenriRousseau.co.uk is a personal website covering the career of famous French artist Henri Rousseau, but is in no way an official website for Henri Rousseau and HenriRousseau.co.uk does not claim to be that in any way. The Estate of Henri Rousseau and their presence hold all necessary copyrights and licences for all of his paintings and other works. All prints, paintings and photos included in HenriRousseau.co.uk are provided as an affiliate to Art.com who hold necessary permissions. Art.com pay us small commissions based on any prints or paintings that you buy as a result of using this website.